The Tulip looks nothing like the boxy skyscrapers currently dominating the world’s urban areas. 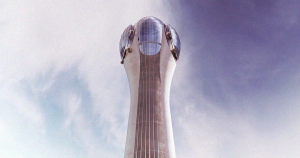 Instead, the proposed tower looks like, well, a glass and metal tulip, with a long stem supporting a bulbous top. But that strange design didn’t stop a London planning committee from sending the Tulip one step closer to construction this week — and their support for the unique project could be a sign that the cities of the future will look dramatically different than today’s urban areas. On Tuesday, the City of London Planning and Transportation Committee voted 18 to seven to back the creation of the 1,000-foot-tall Tulip tower, which was designed by world-renowned architecture firm Foster and Partners. The proposal will now move on to the mayor of London for approval. If granted, construction on the skyscraper could begin by 2020, with the finished building transforming the London skyline as soon as 2025.